Take time for your wellness while your child has fun exploring and playing in childcare – our onsite drop-in childcare. 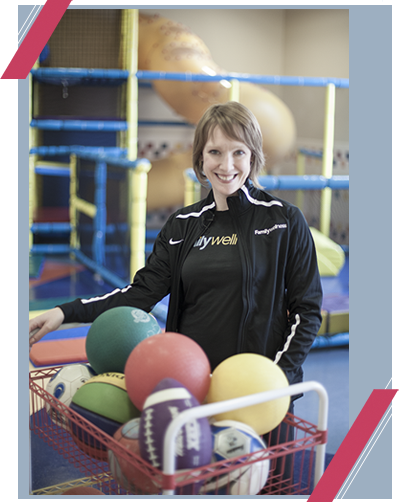 Family Wellness drop-in childcare is designed for safety, convenience, and fun! Our friendly staff will help make your children 2 weeks to 9 years old feel right at home while you have some quality time focusing on your own personal wellness. We change disposable diapers, give bottles, and accommodate nut free snacks (any additional care items such as diapers, bottles or nut free snacks needs to be provided by the user). We also feature a variety of package options for 1, 2, or 3 or more children families. If you have any additional questions, feel free to email our Childcare and Children’s Program Manager Jennifer Wettstein or call her at 701.234.7450. Click the link below for the complete list of Childcare policies. Screen- free zone, (no TV, Movies or Video games) it is all about play and activity!